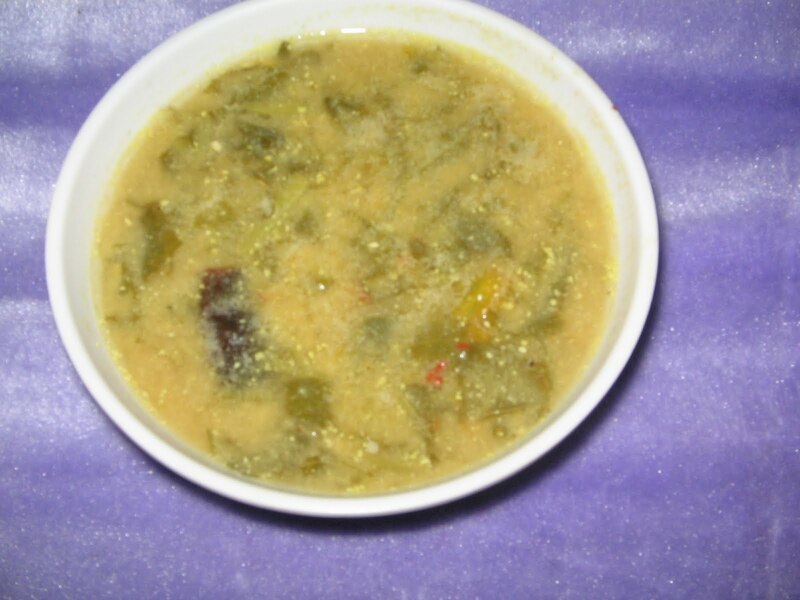 we can prepare majjiga pulusu either with chopped vegetables or chopped thota kura,procedure is the same.Here i did it with chopped thotakura. Place a vessel on the stove,and add oil,mustard seeds,lal mirch slits and green mirchi slits, after spluttering add half cup water and also Tamarind paste to it.Then also add the chopped vegetables or(chopped thota kura)curry leaves to it.Let the vegetables or leafy vegetable be cooked by the water in a low flame upto 10 minutes.Then the butter milk (besan powder mixed in the butter milk) should be added into the vessel ,and salt also should be added and cooked in low flame until it is done. Majjiga pulusu ,flame high lo unte pongi pothundhi,kabatti low flame lone udakali..Boil ayyaka oka 5 mins unchi udakanichhi switch off cheseyandi. Then add the AVA mixture in to the pulusu.Garnish with Kothimeer. I prepare this atleast once in 10 days in my home..